Prototype:French State Railways (SNCF) class BB 422 200 general-purpose locomotive. Assigned to the freight service area (FRET). Dual system locomotive. 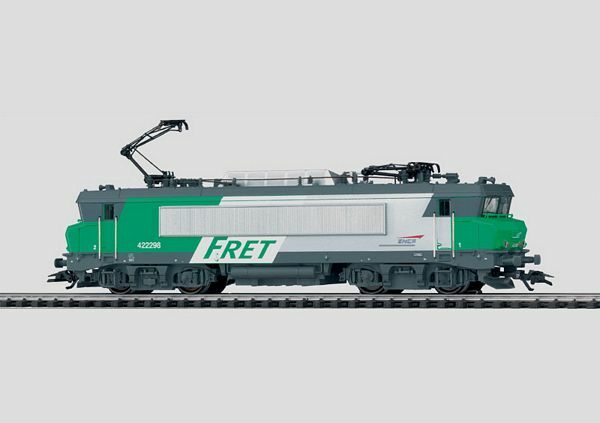 Model: The locomotive comes with a digital decoder, controlled high-efficiency propulsion, and a sound effects generator. 2 axles powered. 4 traction tires. The headlights will work in conventional operation and can be controlled digitally. The sound effect of a horn as well as the acceleration and braking delay can be controlled digitally with the 6021 Control Unit. The pantographs are positioned specifically for this type of locomotive. Separately applied metal handrails and grab irons. Length over the buffers 20.0 cm / 7-7/8. Current paint scheme for the prototype. Horn sound effect in digital operation. Goes well with the 46551, 47211 cars.